In the previous post I described the Customization Aware Web Resource (CAWR) approach. This approach allows a dynamic reflection of certain customization changes in custom Microsoft Dynamics CRM client (Web Resource, Mobile app, Portal form etc.) as it query and apply metadata properties to relevant form controls. In this post, I’ll demonstrate an actual implementation of the CAWR approach using SOAP, for those of you who use Microsoft Dynamics CRM 2011 to 2015. In the next post, I’ll replace SOAP with Web API. You can download an unmanaged solution containing the working sample demonstrated in this post. This solution was exported from MSCRM Online (2016) but you can easily extract the solution file and get to the actual Web Resources. This doesn’t look much, but looking at the actual form HTML, you can see that the form elements contain no characteristics beside id. Since this is a Customization Aware Web Resource, all of the settings are retrieved and applied dynamically according to the Lead entity metadata. 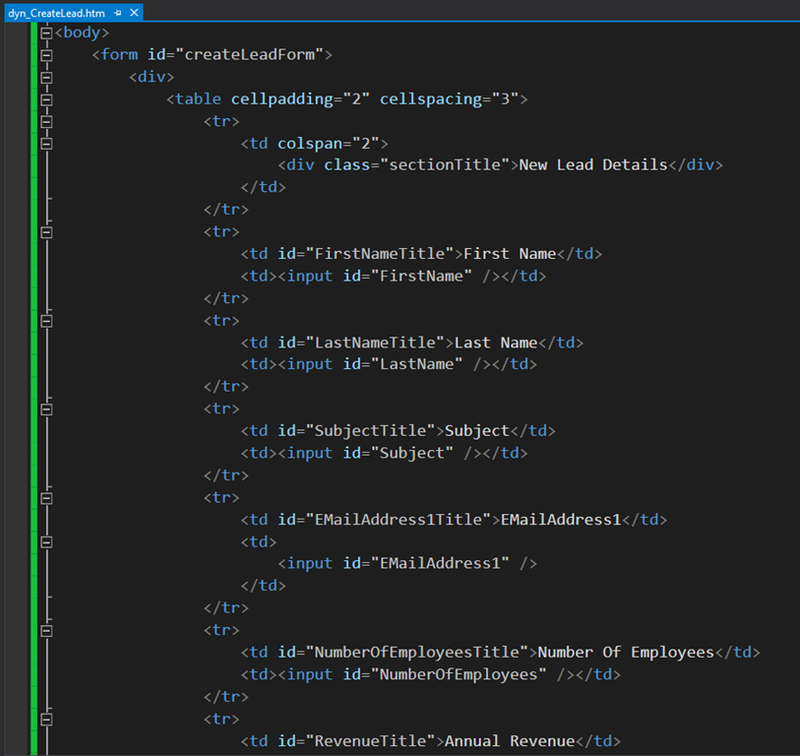 SDK.MetaData.js – query MSCRM metadata. This library can be found in the SDK. Sdk.Soap.js – abstracting SOAP communication. This library can also be used to query MSCRM metadata. 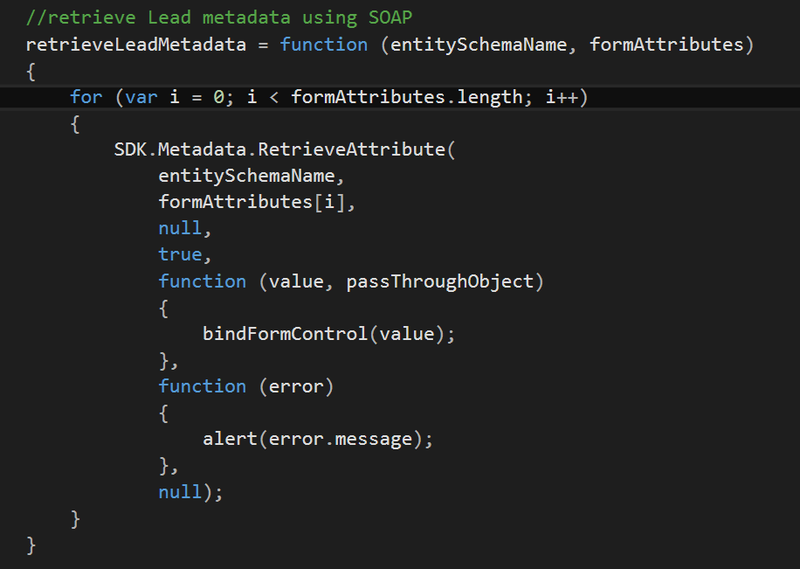 The SDK.Metadata.RetrieveEntity will return all (~200) Lead entity attribute in one request. Performance wise, If you are only using few entity attributes in your Web Resource, consider multiple SDK.Metadata.RetrieveAttribute requests instead. Ideally, this CAWR approach will be implemented in a small utility library in the future. Given enough community interest, I’ll publish such library on CodePlex. 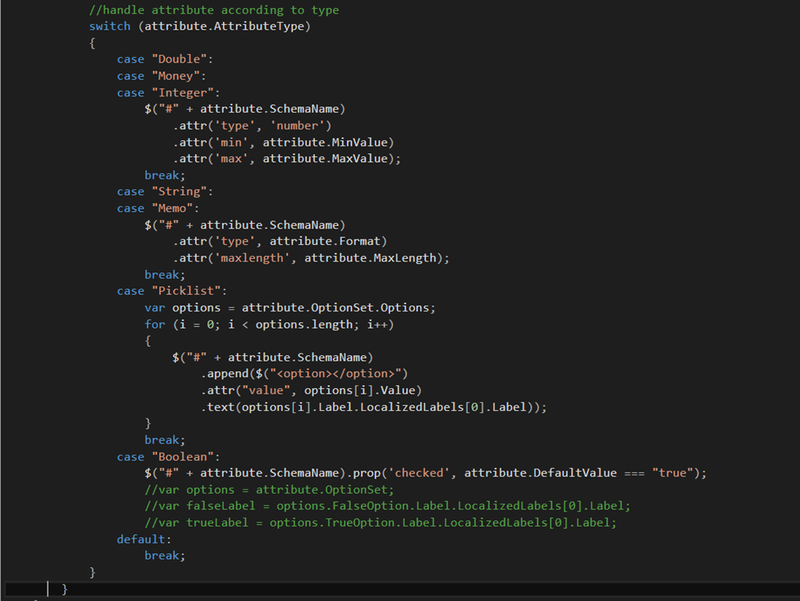 In the next post I’ll demonstrate similar functionality using Web API endpoint instead of SOAP.